I-nomad: "I Put a Cell on You"
"I Put a Cell on You"
Since they were invented and marketed, people are talking about the risks of using cell phones, so far the discussion was limited to the possible danger of radio-frequent radiation effecting your brain tissue. Since last year however there's a completely new potential danger when applying cell phones, namely getting cursed mobily. Watch out making enemies here in Isan, Thailand, they might consider hiring a cyber-voodoo practitioner. 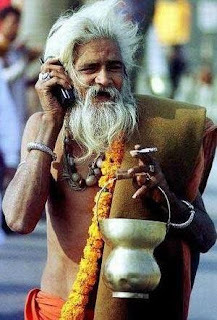 Cyber-voodoo practitioners don't need your hair, cloth or photo, just your phone number will do. Lot's of people here don't pick up their phone anymore when receiving calls from strangers. The danger might spread and smart cyber-voodoo's might open web-sites with easy Paypal paid services. An easy choice for pay back time to your ex-pal. To prevent them from doing so, I registered the domain name cellcurse.com. That's all I could do for the moment and don't tell me I didn't warn you. "I Want to Marry a Farang"
Proof that Ska never died..